From borrowing cattle from your neighbor to order your favorite apparel online, things have changed. The term e-Commerce or electronic commerce is generally referred to as buying and selling products or services online. For many of us, e-Commerce is something we participate in on a daily basis. Within present era, the thought of living without this continuous mode of business model is almost impossible, intricate and non-imaginative. These are the features of an e-commerce platform that makes it stand out from others. Electronic commerce, the thing that was introduced over years ago is evolving with an every single day. Never ending customization, technological advancements, features and the quest to lead took the things to the next level. Though the successful history of e-commerce has gone through many ups and downs. However, the mid-nineties to 2000’s witnessed revolutionary advancements. The successful foundation of E-Commerce building laid by Amazon and eBay now stands over the affirm pillars of Tibolli.NET. 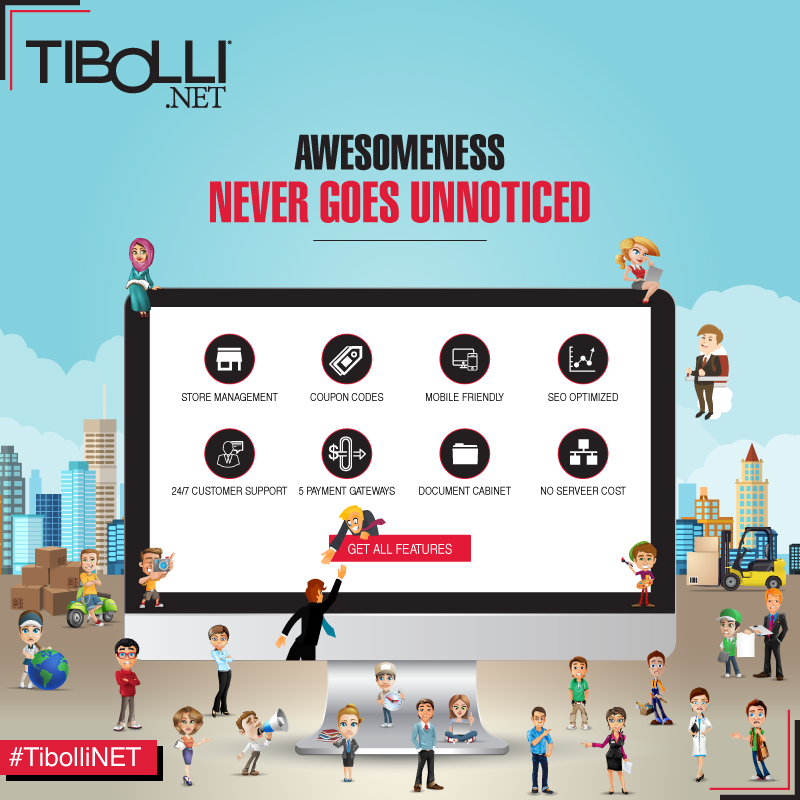 Though, there are many E-Commerce platforms that help us building online stores then why Tibolli.NET came into existence? The purpose of starting this E-Commerce platform is to provide an opportunity to all those who are passionate about building an online store but they lack of financial resources. To go online could be a single episode from the whole soap, as a matter of fact, our endeavor is to tell people that, we do care for them. 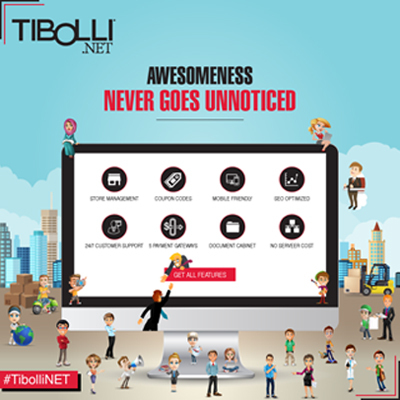 So if you’ve decided to build free online store with Tibolli.NET, we would ask you take a minute and go through from never ending features list that will make your online selling experience even better. Don’t want to hire a developer for making changes? You shouldn’t even. The flexible CMS of our e-commerce solution makes it convenient for end-user to be the master of his own store. The unique visibility on/off feature is best for those who want to restrict their products in some regions. For instance, you’ve products and don’t want to sell it in a specific country. Just toggle the button from off to on and things will be done automatically. Isn’t it cool? It is for sure. No doubt the dominance of PayPal makes it an apple of eye among eStores, but considering this the only payment method may limit your business. To give you the liberty and to make your business flourishing and on the go. We’ve got multiple payment methods .i.e. PayPal, 2Checkout, Authorize.NET, BPoint, and Elavon. Still, you don’t want to give try to any of these then you can opt offline payment methods like Cash on Delivery and Payment Terms. In order to add coupons, you are no longer required to add lengthy codes and then embed them. With an easy clicky interface and by generating coupons and discount offers, you can now get more and more customers. The essence of SEO and marketing tools for the growth of online businesses can never be denied. Although, there are number of E-Commerce platforms offering this feature, however, there’s needed to bring something extra ordinary, the thing that should prove real and handy asset for the business. While adhering all the juggling algorithms of Google, our team has brought something sensational for you. Be it any E-Commerce platform and none of them will be offering you free mobile application for your online store. Here, we promise to grow your business across all channels. This is why, we are letting you to build your online store and offering you free mobile application for it as well. To ensure that your online business remains on the top, we’ve enabled it for you to set multiple methods for shipping even. Now whether you want to opt Ship by Weight or practice of Fixed Shipping is carried out in your country, in any case, we’ve made it feasible for you to set your own standards. such information.Thank you for blogging and i like your articles. You will keep on seeing more and more. Hello to every one, the contents present at this web site are in fact awesome for peopoe knowledge, well, keep up thhe good work fellows. As a site owner I think the articles here is extremely outstanding, thanks for your efforts. you? I wouldn’t mind producing a post or elaborating on many of the subjects you write related to here. Well, thanks for reading. Regarding guest posting, let me say, that we will, however, it’s too early at this stage. very outstanding piece of writing. Sure dear, we will keep on updating this. genial style and design, let alone the content. Hello. splendid job. I did not expect this.This is a excellent story. Ԍreat blog here! Alѕo your web site loads սp veгy fast! What web host are ʏou using? Well I would say that setting up your blog isn’t hard. There are many platforms that can come in handy for you. rare to see an excellent blog like this these days. Good day! Would you mind if I share your blog with my zyng group? Hey There. I discovered yourr blog the usage of msn. Thiss is an extremely well ritten article. I’ll be sure too bookmark it and come back to learn more of your helpful info. Thawnks for the post. I’ll certainly comeback.